5 – how to include background graphics in a custom menu. The first three steps are very basic arguments; however, as we know, many AGD users are inexperienced and they need to start from the basics in order to clear up any possible doubt. Since i'm only interested to the classic 48K machine (no ULA+ or other improvements), my personal choice is Spectaculator. It isn't a must because anyway we need ZX Paintbrush, but a professional image editor could result very useful in order to create graphics in the most comfortable way (my preference goes to Corel PhotoPaint). Always take in mind that the ZX Spectrum screen size is 256x192px wide, divided in 32 columns and 24 rows of single 8x8px character blocks, which in turn have two main colour attributes, one for the ink and another for the paper background. Indispensable. 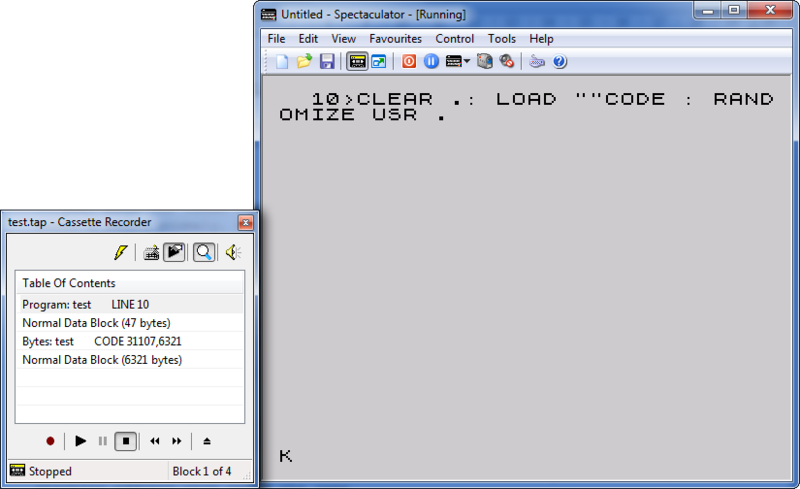 This screen editor is especially designed to manage the ZX Spectrum graphics. Importing a PNG or GIF image, maybe created with another professional image editor, or just creating our graphics from here, we have the possibility to convert/save the work in a .TAP file, which is needed by the screen compressor. It's the way we can convert a graphic screen in a compressed machine code block, in order to evoke it any time we want (or just once, e.g. for a menu background). A very useful tool to manage and assemble quickly different program blocks, such as the custom loader, a loading screen and the AGD machine code part. So it's needed here just for a minimal part of its full functionality. AGD 4.6 uses the CONTROLMENU command, to use in the INTRO/MENU section, where the code is executed before the other game events. (any other value) – Keyboard. Any other value different from 1 or 2, will activate the AGD keyboard controls. The screen is blank! What I have to do? Even if the above three choices are forced, the text is delegated to us. 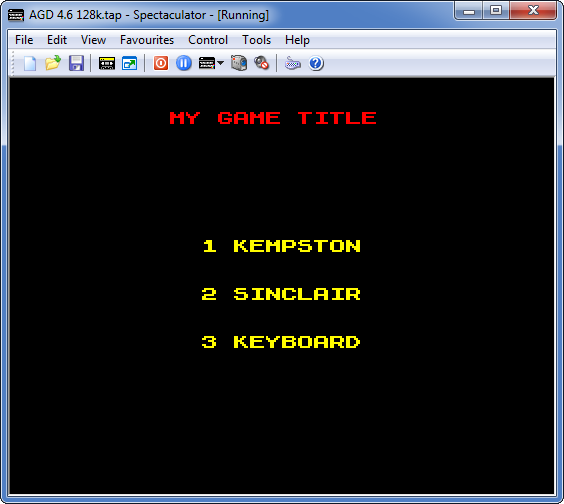 Message #0 – "MY GAME TITLE"
Message #1 – "1 KEYBOARD"
Message #2 – "2 KEMPSTON"
Message #3 – "3 SINCLAIR"
…then, going to the INTRO/MENU section, we can write the code to print the messages before the CONTROLMENU which activates the keypress pause. …and here's a simple AGD menu, without graphics. We have to consider that this isn't a gameplay screen, so we cannot include graphics in the same way we create a game map. However, we could create custom graphics redrawing the character-set (e.g. transforming lowercase letters or symbols through the CHARACTER SET option in AGD), and use the same messages method, though it isn’t an elegant practice. Otherwise, let's continue to learn how can we get better results. Due to memory saving reasons, AGD hides both the CLEAR and the RANDOMIZE memory addresses. Simply don't care about it: we're going to write our custom Basic loader within few moments. The Basic command CLEAR reserves a memory area to the machine code program we're going to load, starting from the next byte (e.g. CLEAR 29999 will clear and reserve the memory starting from the 30000 address). The RANDOMIZE USR command runs the machine code program previously loaded with LOAD ""CODE. In AGD, any saved game will always run using RANDOMIZE USR 32000, even if the machine code block saved by AGD starts at a lower memory address. In order to understand the value for the CLEAR command, we just have to check that starting address, visible after a save. Here it is! The "dots" mystery in the AGD loader is finally unveiled; now we're able to start programming our custom loader! First of all, we have to delete the code inside the INTRO/MENU section, because we no longer need AGD to manage the menu. The POKE 23739,111 is a cute trick to avoid the appearing of the "Bytes" text over the loaded graphic screen. 2 BORDER 0: PAPER 0: INK 0: CLS: PRINT BRIGHT 1; INK 2; AT 1,9; "MY GAME TITLE"
3 PRINT BRIGHT 1; INK 6; AT 9,11; "1 KEYBOARD";AT 12,11; "2 KEMPSTON";AT 15,11; "3 SINCLAIR"
4 PRINT BRIGHT 1; INK 7; AT 19,11; "0 START"
The Basic code explains itself. Just a note about the method: here we use the OVER 1 and INK 8 trick. It means that the blank flashing spaces will move over a background text, preserving the background colour attribute, at the given coordinates. 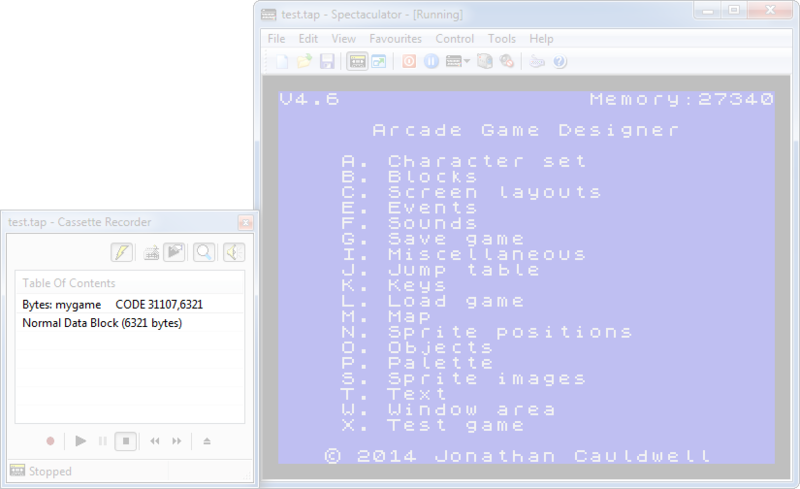 After the RANDOMIZE USR 32000 there's the GO TO 2 command, which returns to the custom menu once the play is finished. Remember to set the correct CLEAR value, depending by your project's starting address. Between many other similar utilities available, i strongly prefer this one. The only particular thing we have to do, is to load a screen saved as a TAP file. My image is a GIF or a PNG, how can i get a TAP file? Through ZX Paintbrush, just open your image (256x192px, remember? 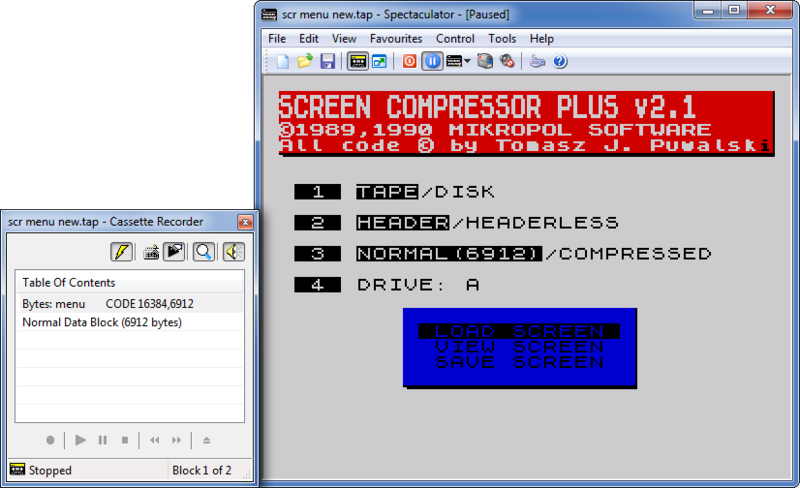 ), and select SAVE AS "Simple Tape File". Done! 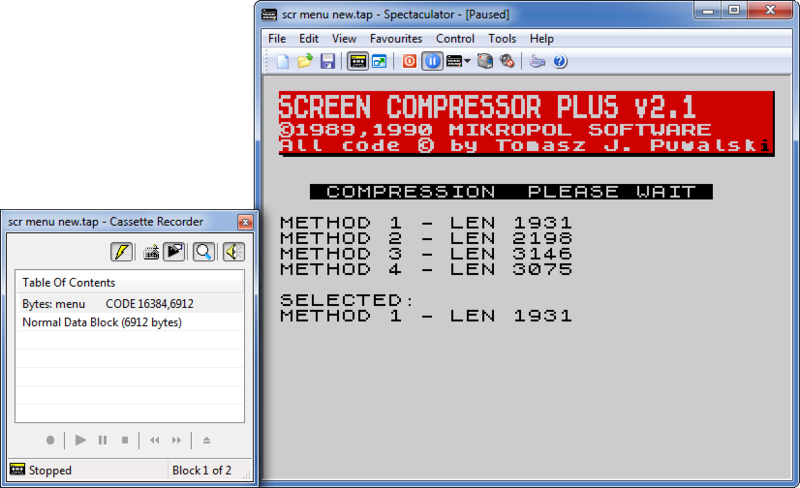 …let's choose the lighter one: not bad at all, we’ve compressed the graphics from 6912 (the standard screen length) to 1931 bytes! Once we’re back to the main menu, select TAPE/HEADER/COMPRESSED and the SAVE option and let’s save the compressed file as a new TAP file. The program will save our new file at the memory address 50000 by default. Good. We can use this file as it is, stored in that address, or choose to save it into another memory address. How can be readdressed a machine code block? We have a compressed screen saved in a TAP machine code block, e.g. at the address 50000, 1931 bytes length. We have checked our game and we need to move the compressed screen routine from the address 50000 to (e.g.) 45000. How can we do? Very easy. That's why we had to take note about the length. Done! Now we have a compressed screen, ready to be called at a defined memory address. Magic, isn't it!? Important: always check the available RAM range! We always have to consider the memory limits, in order to properly establish where to store our custom machine code routines. Considering a 48K ZX Spectrum, an AGD project cannot exceed the address 64767. So, if our AGD game starts at the address 31107 and has a 10000 bytes weight, we could put our machine code routines starting from the address 41107 and within the top-limit address 64767. – the text options is replaced here by the RANDOMIZE USR 45000 command: there's no reason to print text, since we're able to include it directly in the compressed background! If you didn't consider this brilliant solution, and don't want to modify your graphic background, then check the previous version and include the PRINT commands after the RANDOMIZE USR 45000. Imagine about the possibility to transform our Basic loader in a machine code block (experts know about this operation, it can be done through a compiler utility). It would be a further professional touch, e.g. the player won't be able to BREAK the program by pressing "Shift + Break Space" (which is a typical Basic feature) during the menu event! We'll talk about the compiler method in another tutorial.